A couple of my friends requested birthday cards (one friend for her granddaughter, and other for his daughter). Here are the two cards I came up with. Cindy fell in love with the Butch and Mimi stamp and wanted a card with them on it. I found the little Inkadinkado paw print stamp at my local Michael's store and just had to incorporate it on the card, too. 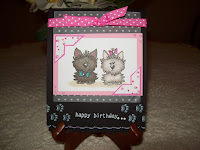 The pink and black layout was perfect for the two little pups. Chris' daughter is turning 13 and I thought Stamping Bella's Fabby (turned into a cheerleader) would make a great card for a "tween". I found the little pom-poms also at Michaels, so her purse and sunglasses turned into the two pom-poms. 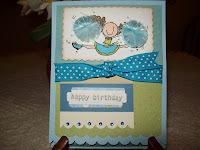 They both loved the cards and were very excited to have a special handmade card for their celebrations. I need to show Lily this one...LOVE those pom-poms!! !